It was foggy again this morning and cold. I was lazy and didn’t feel any need to rush out of my sleeping bag into the cold. Eventually I did get up and make breakfast. I started the car though and turned the heater on full blast to warm up my clothes and waders before I put them on. I finally left my warm car and made the hike down the Grande Ronde River to Rondowa. It is a little over three miles, so it is not too bad of a hike. Someone had once told me it was five miles and I had never checked on the maps to see. It really wasn’t terribly cold . . . unless you compared it to the inside of my sleeping bag. Rondowa. It sounds mythical. It has the same ring to it as Valhalla, or something along those lines. Rondowa. Just saying it makes me think that something special awaits me. The confluence of the Grande Ronde and the Wallowa. Rondowa must be good I thought to myself as I walked. 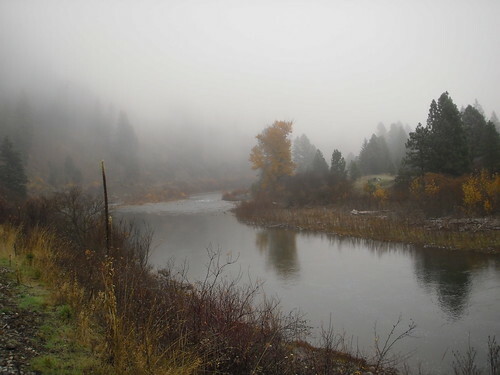 It has no public road to it and the Grande Ronde is a great steelhead river. Since I have never really fished the Grande Ronde before (except the day prior) I am simply taking people’s word that it is a great river. And judging by the number of people who fish it, it must be great, otherwise why would they line up shoulder to shoulder to fish it? When I reached the confluence there was a big run/pool a little downstream. I went about half ways down the fast stuff and began fishing. It wasn’t too long until I felt the weight of a fish on the end. This hatchery hen took my olive woolly bugger. I fished for another ten minutes and I had another hatchery hen on my stonefly pattern. Another ten minutes or so of fishing and I had a third hatchery hen on my egg pattern. “Wow,” I thought, “If the fishing is this easy down here all day I am going to get bored with steelhead fishing.” No worries there, that was the last fish out of that run. I probably could have camped out there and caught more fish throughout the day, but that would also get quite boring so I headed downstream. The Grande Ronde is a good sized river after the Wallowa runs into it, but I did not feel lost on it like I did on the John Day just a few days earlier. This is the kind of river I am use to. It runs between mountains and is full of big boulders and rocks that get all slimy and are hard to walk on. None of that small pebble sized stuff that is easy to wade like on the John Day. The Grande Ronde has lots of medium to big sized boulders to trip you up or slip on. 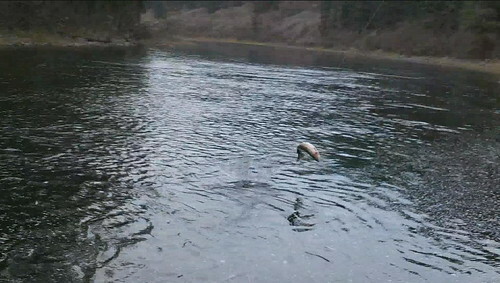 I landed several more steelhead further downstream and lost a few as well. One thing about fishing a bigger river like the Grande Ronde, it would be smart to be willing to change your setup as you work through a run. Here is what I am getting at. A run or pool on the Grande Ronde might be a quarter mile long or more. On the Imnaha, in a quarter mile I may fish 4 different pockets/pools/or runs. 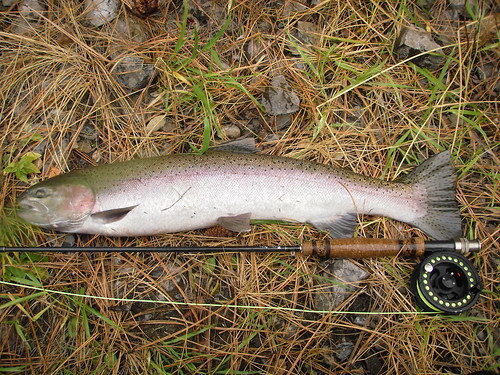 I can fish almost the exact same setup on the Imnaha effectively through all of those spots. I may only have to vary how far upstream I cast to avoid snagging on the bottom. Because I am used to fishing smaller/fast flowing rivers, I tend to fish heavily weighted flies and am not afraid to add a couple of split shot if I don’t think I am getting my flies down in some of the fast tumultuous runs or pockets. What I am noticing on the Grande Ronde, and somewhat on the John Day, is that I fish the heads of pools and runs very effectively. This is where I have caught my fish. But as I work my way down the run or pool into the slower water, I began snagging on rocks. So I will often head to the next spot rather than change my setup. The only problem is that it may be a half mile or more before the next good spot to fish. So I am spending less time fishing on these bigger rivers than I would on smaller ones. What I should do instead is change my setup or add a thing-a-ma-bobber to keep my flies from getting as deep. I have just never cared much for fishing with an indicator, although I will use one on occasion. Was it good enough to be mythical? Probably not. But it wasn’t bad either. I landed 5 steelhead for the day and lost a few more. 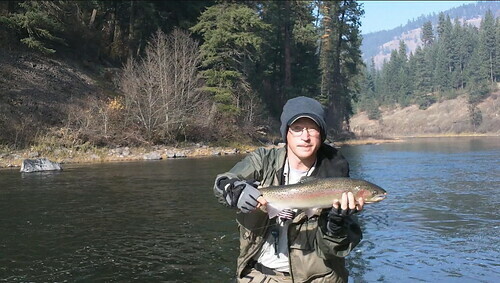 I again also caught some beautifully colored large rainbows. They were just icing on the cake. 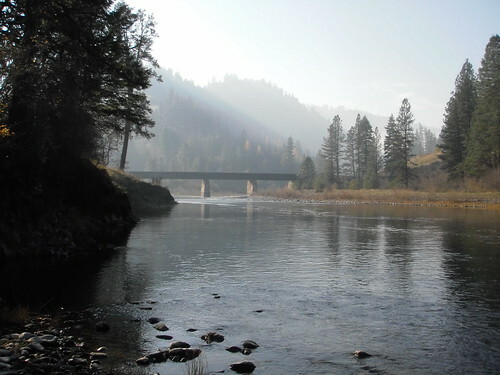 Tomorrow I will head back to Rondowa, but I will fish upstream on the Wallowa River.